Product: New TriStar Tri Star MG1 MG2 EXL Vacuum Motor Upgrade. Description: Newest available Tristar motor, upgrade your existing EXL, MG1 or MG2 motor. Includes wiring diagram, wire nuts, and new style motor mount. Fits: All A101 Series canister vacuums. 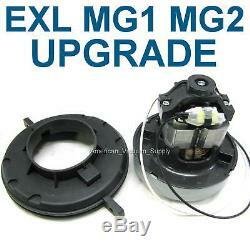 The item "New TriStar Tri Star MG1 MG2 EXL Vacuum Motor Upgrade" is in sale since Monday, August 19, 2013. This item is in the category "Home & Garden\Household Supplies & Cleaning\Vacuum Parts & Accessories". The seller is "american_vacuum_supply" and is located in Cloquet, Minnesota. This item can be shipped worldwide.